Are You Getting Excited For The 2018 Winter Olympics? 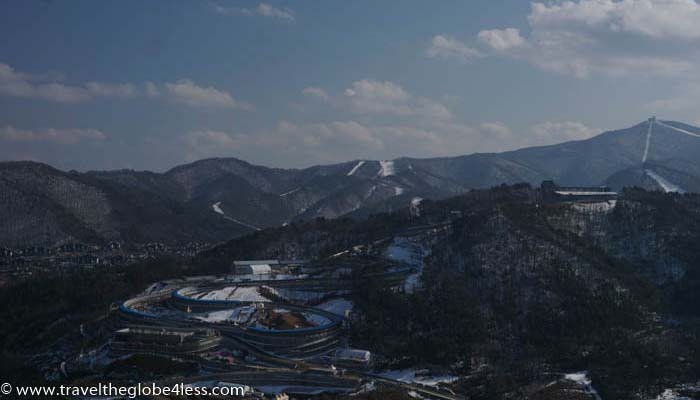 Home / Destinations / Asia / Are You Getting Excited For The 2018 Winter Olympics? With just four weeks to go until the 2018 Winter Olympics, is anyone else getting excited? Are you already planning your TV itinerary, or even better some flights? 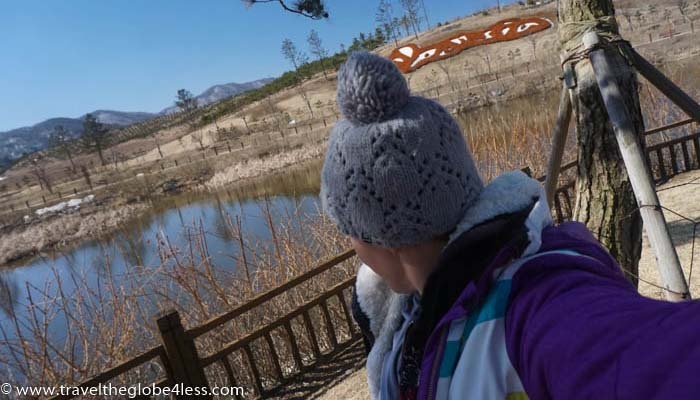 If so, you need to read this updated post sharing our experiences in South Korea. Gazing up at the towering Alpensia Ski Jump, I can hear the roar of the crowd cheering on the athletes. Then, eerie silence as a lone jumper takes his place, crouched perilously above the gaping void below. The hush of the crowd is interrupted by a whooshing noise. He releases and swoops gracefully down the steep descent, taking flight and soaring into the air. The crowd erupts in applause as he clatters to the ground, avoids a wipeout and sweeps into the arena, grinning from ear to ear. Of course, this is all my imagination conjuring up images. The only sounds on this day, in March 2017, are those of work men, building construction and chattering tourists. 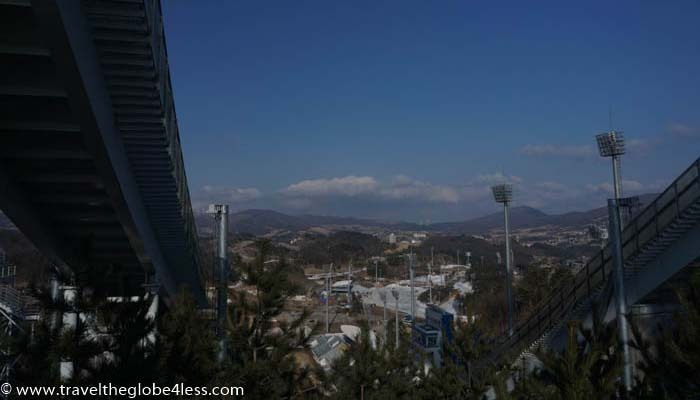 For just 4,000 won (£2.50), you can visit the observation deck of the 2018 Winter Olympics ski jump tower. High above the town of Alpensia, you can marvel at the panorama of ski fields, the bobsleigh and the terrifying jumps below. Even the baby jumps have me cowering in fear! 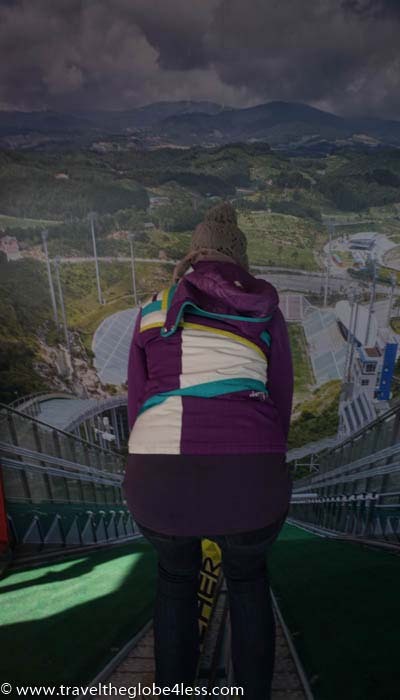 It would be rude not to give ski jumping a go, right? The ski jump is just one of the 2018 Winter Olympics venues in the small hamlet of Alpensia. Built in 2009, it is a purpose-built ski resort, reminiscent of Vail or Winter Park in Colorado. A quaint, pedestrian zone, with numerous restaurants, graces the base of the slopes and makes an ideal base for anyone who loves winter sports. 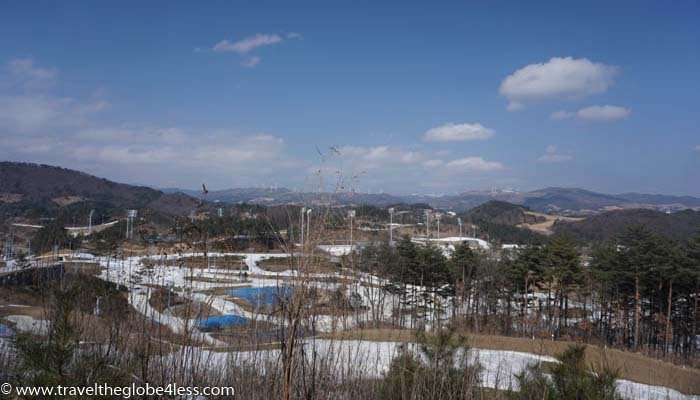 You can drink in views of the Alpensia Biathlon Centre from the road heading to the ski jump. Despite having taken many winter holidays, I’ve never seen a cross-country course before. I am awestruck by the loops and turns that weave their way through the circuit. It’s not the flat course I expect, with undulations to make your thighs burn. In the shadows of the tower, on the opposite ridge, is the Alpensia Sliding Centre, another venue that I’m sure to be watching in the 2018 Winter Olympics. A long, blue tunnel snakes back and forth across the hillside, as a metal cart tumbles down its glistening corridor. Even from the top of the ski jump, a few hundred metres away, I can hear the loud rattle of the carriage, as it hurtles perilously down the course. As fate would have it, we arrive during a test event for the Olympics. We can request FREE tickets to watch the British Skeleton team compete in the final event of the World Championships. Unfortunately, the start time clashes with our bus back to the airport, and we sadly miss out on a once in a lifetime opportunity. 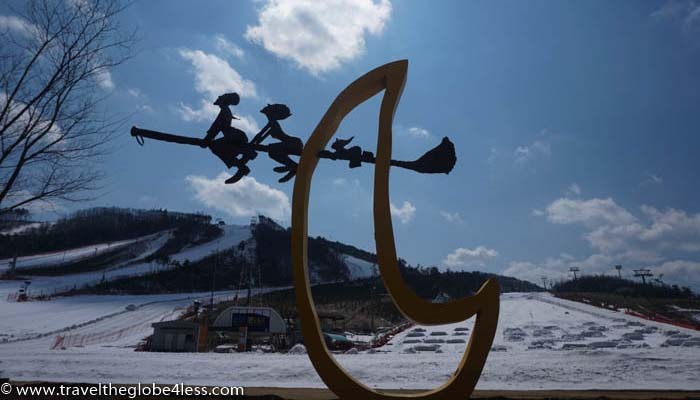 The last Olympic venue on our hit list, is the ski resort of Yongpyong, a short cab ride away from Alpensia. The alpine skiing competitions will take place here, but will only use a fraction of the mountain (see Rainbow pistes on the top right of the trail map). Sports enthusiasts will still be able to combine skiing with spectator sporting events during the Winter Olympics. Sadly the actual downhill slopes which will be used for the Olympics were closed during our visit, so I cannot say I have skied them. Nevertheless, there is some stunning skiing on offer at this resort. 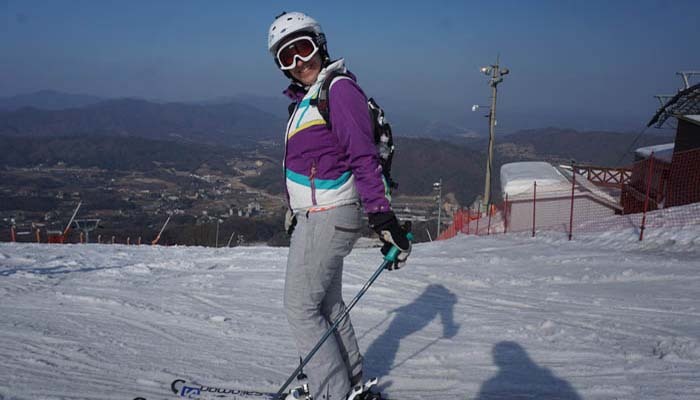 You can find out more about what we thought of the skiing in South Korea here. For sports fanatic, the buzz in Alpensia is electric. Teams from nations around the world converge to compete in Paraskiing events, bobsleigh and sled. We eat dinner alongside TV crews and athletes from the United States, Switzerland, Ukraine and many more countries. If this is how exciting it is now, with just a tiny fraction of rooms occupied, I can only begin to imagine the magical atmosphere which will grip this town come the Winter Olympics. If you are a fan of the Olympics and would like to combine spectator sports with skiing, I highly recommend you start looking for flights on Skyscanner and start planning your trip to the 2018 Winter Olympics. Have any of you lucky devils booked flights and tickets to go see the Winter Olympics in person? If so, you lucky devils! I’d love to hear about your plans. For those of you watching from the sofa, like me, I’m sure we are still going to have fun. Last night on American TV was a program about Tonya Harding with a lot of hype about the new movie “I, Tonya”. Naturally I was glued to the TV loving every minute of the interview. I love the Olympics, Winter or Summer! I was in Salt Lake City during their games and the energy around the city was amazing! I’ve skied several of the resorts there on the same runs. I was also living in London during their games and auditioned for the Opening Ceremonies. I made it but had to drop out due to a (stupid) job. But there as well, the energy was incredible. We went to several of their events, too! I hope to experience another Olympics again! I haven’t skied in Utah but those games definitely put it on my list. I couldn’t get any tickets at all to the summer Olympics in London which I was gutted about. I got tickets to the Paralympics thugh and that was incredible too. Just a shame that we saw Oscar Pistorius blow us all away with his performance and then less than 12 months later, he was all over the news again for the wrong reasons. I need to check out that I,Tonya. Don’t you hate it how work just gets in the way some times? Anne, we are headed to the Olympics and the anticipation is kiling me! We haVe been watching a number of US qualifying events to get psyched up. bTW used miles to fly to Seoul in first on korean Air and Hyatt points to stay at the Grand Hyatt Seoul. Making a stop over in Hong Kong and Macau on the way home. Love miles and points! Oh wow that sounds so exciting. I’d love to hear what you think of first in Korean when you make it out there. Where are you staying? I was in the Italian alps a few weeks ago and was watching some of the warm up events and it was really exciting. They kept showing all the pictures of the places we visited. I really think it is going to be a fabulous event so hope you have a super time. Oh, I would love to visit the 2018 Olympics! I love Japan anyway and I feel like this is the perfect excuse to go back! I do love watching the winter olympics. The things those people can do! It’s an incredible skill. I’ve seen a few of the olympic parks after the Olympics are over. It’s awesome to see the ski jumps in person. The winter games always slip my radar! I think its probably because I’m from the UK and we don;t get much snow so don’t do too well at the winter games. There just isn;t that much hype. Thank you so much for bringing it to my attention. I’ll have to make sure I find somewhere to watch some of it…although I’m in Guatemala so I’m not sure how easy that will be haha. Same here but as I’m a keen skier I try to watch some of it. I always find it fascinating that so much is built for the Olympics. It definitely looks like it’s going to be an awesome spot for the Olympics next year! I have to admit that I didn’t even know where the Olympics were going to be! Thank you for informing me. I can understand how you would have felt at the top of the skiing tower. 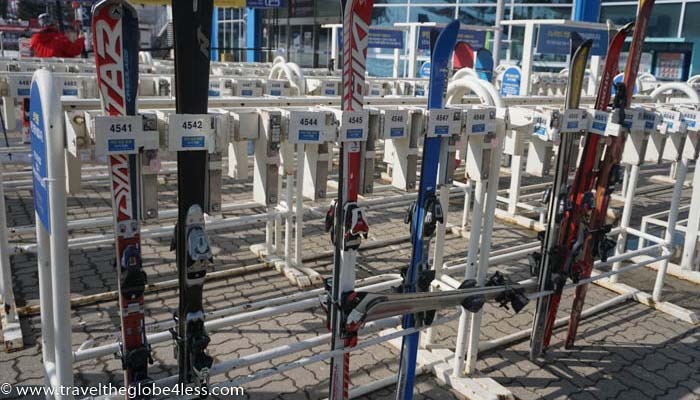 It must have indeed been a thrilling experience to visit the venues of the 2018 winter Olympics.There must have indeed been an air of hushed expectancy in these places as they ready up for the big day. Imagine how they will get transformed when the Olympics kicks of and the air is rent by exciting cries of the spectators. Yes I’m excited to watch the Olympics and your post has made me even more excited. 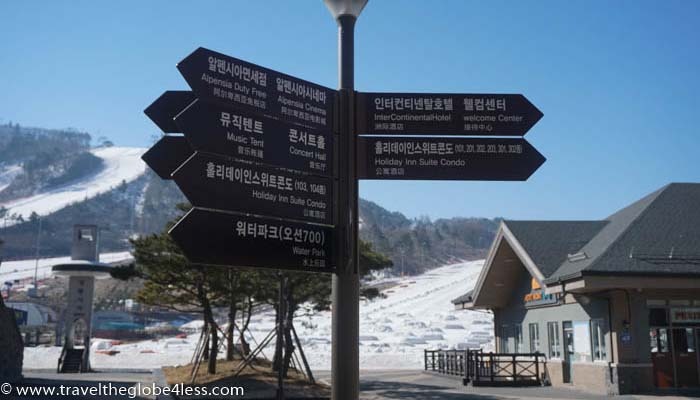 For just 4,000 won, visiting the ski tower seems like a good idea! Great share. How exciting to see it get built and prepared! 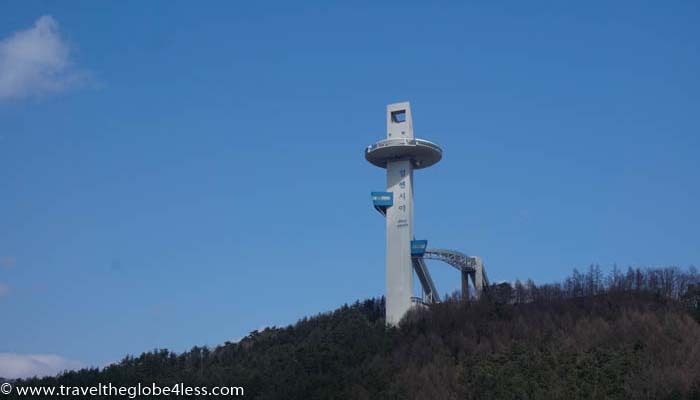 I would definitely visit the observation deck of the ski jump tower for only 2.50 euro! Ski jump is one of my favorite events of the winter olympics. I swear I hold my breath every time someone gets into position. And while I watch quite a few of the events when they are broadcast live, I’ve never really considered going to actually see the games. I guess I’ve always assumed it would be out of budget or too hard to get tickets to, etc. Now you have me thinking! Yes I love the ski jump too although I almost darent look. It must take real guts to actually jump off there! Omg this is so awesome! I wish I could go! But I have different travel plans for 2018! 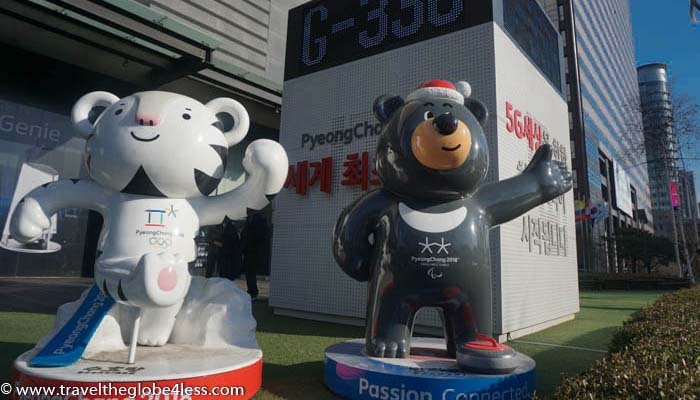 I m in Seoul right now and it is very exciting to be here and seeing the Olympics mascots everywhere around the city. I think it is gonna be amazing funto be here during the Olympics next year. It is not far away…. It sounds like a lot of fun and electric energy, I should add attending the Olympics to my list! I love the curling, skiing and ice hockey! I can’t say the 2018 Winter Olympics are on my radar. Though I guess as a hockey fan, I’ve been hearing about quite a bit, as the NHL decided not to allow players to participate.